A compilation of thoughts by a woman with breast cancer. When she received her diagnosis (“the most devastating news I had ever had in my life”), NPR News executive Sikka had just finished an interview with President Barack Obama, and his statements swirled with the myriad of thoughts suddenly rushing through the author’s mind. “What my doctor was saying competed with words from the president’s interview in this cloud in my head,” she writes. Fortunately, she had numerous friends and family to help her through the monthslong process of mastectomy, chemotherapy and recovery. 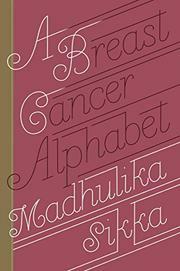 Sikka has gathered together her reflections and discoveries of being in "Cancerland" in an A-to-Z guidebook to the entire process of cancer diagnosis, treatment and life afterward. The author examines the process of coping with the waves of feelings one will experience (anxiety, guilt, indignity and others), the need for pampering and the odds of a diagnosis—one in eight women in the United States will get breast cancer. Sikka frankly explores the nature of breasts and how these intimate parts of the body suddenly become everyone's business, from doctors and nurses to brothers and male co-workers. She discusses the lack of sexual desire caused by the chemotherapy and pain and the need to use any and all available drugs. “Drugs are your friends,” she writes. “Let me repeat, drugs, pharmaceuticals of all kinds for all things, are your friends. Pill-popping, vein-coursing drugs are your friends." Whether you want to Quit, need Kindness from a friend, or long for a Vacation, Sikka gives counsel. Sometimes humorous, always honest and straightforward, this little book offers the perfect combination of practical advice and personal musings to help any woman, her family and her friends handle the complicated road through Cancerland. Insightful, helpful comments on living with breast cancer.